Bella & Harry LLC, 9781937616007, 35pp. 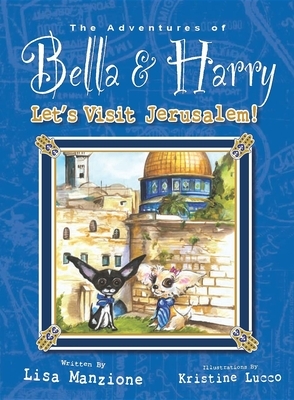 Join sibling Chihuahuas Bella and Harry as they travel to Jerusalem with their family and visit Masada, the Western Wall and the Old City. Along the way, learn about local cuisine (such as shawarma and knafeh) and basic Hebrew phrases. The Adventures of Bella & Harry is a picture book series that chronicles the escapades of a pup named Bella, her little brother Harry and their family, who travel the world exploring the sights and sounds of new, exciting cities. The "Bella & Harry" series is intended to be an informative, interactive and exciting way to introduce children to travel, different countries, customs, history and landmarks with the educational value of this book cleverly disguised amidst dozens of illustrated pages which are sure to win the hearts of young readers. Traveling the world with these two cute and cuddly Chihuahuas will allow the young reader to gain an appreciation of the world and its cultural diversity. Happy Travels from Bella Boo and Harry too. Author: Lisa Manzione The Bella and Harry series of children's books is Lisa Manzione's first foray into children's fiction writing. As a member of the Society of Children's Book Writers and Illustrators (SCBWI), Lisa's entrance into the field of literature is one she has eagerly awaited and is very passionate about. As the daughter of a single parent who worked for a major airline, Lisa's exposure to (and interest in) travel began at an early age. Later in life, as Lisa's own children grew up and her love of animals continued, the idea for the Bella and Harry series was born. Illustrator: Kristine Lucco Born in rural Pennsylvania, Kristine's passion for art began at a young age. This interest in art continued and ultimately led Kristine to study at the Art Institute of Fort Lauderdale. Now a mother of two avid junior readers, Kristine's unique talent and particular flair for children's themes has evolved quite naturally into the world of children's books and illustrations. She is quick to credit her own children for inspiring this phase of her art, as it is often conceived by seeing the characters and places through their eyes. In addition to her work on the Bella and Harry series, Kristine has also illustrated the most recently recognized children's book, "Wacky Jacky, The True Story of an Unlikely Beauty Queen."